Well, we had a spectacular launch and exactly one week in the water. Then came Arthur. Arthur, who was supposed to turn South. Arthur, who was supposed to fizzle out. Arthur, which wasn’t supposed to be anything to concern ourselves with at all. 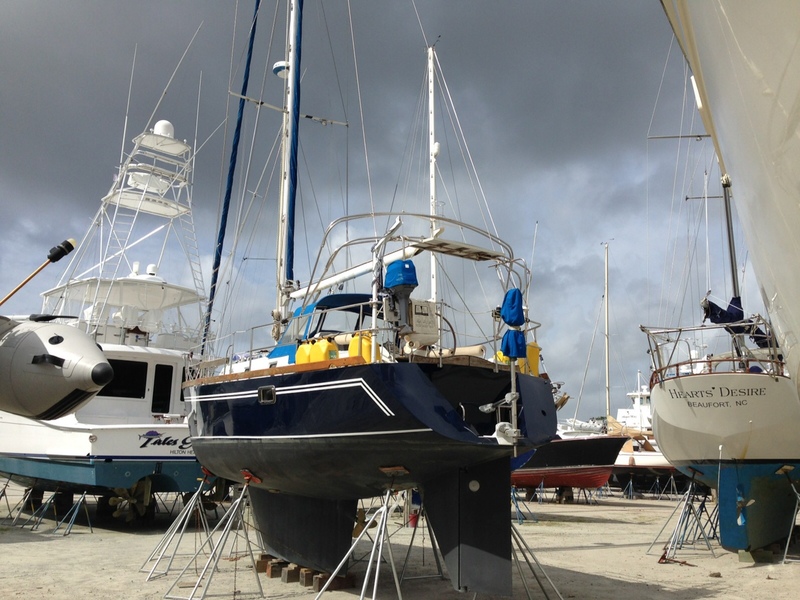 While my Better Half was tying himself to the mast and battening down the hatches, the boatyard changed their mind and said that he couldn’t stay at the dock like he had previously been told. “Go away and good luck” was the distilled message. That was Cool, Friendly and Helpful. We are new boat owners, not experienced Salts. My Better Half is alone on a boat with an engine that has a bit of a problem (oil leak? exhaust leak? leak leak?). Arthur is heading his way and looks nasty. He throws himself on the mercy of the boatyard. They are hauling out other peoples boats and are busy. Oh wait, they’ve had a cancellation and, good news!, can just fit him in to their schedule of getting rich from misery. They make him sign a bunch of papers, charge a whole bunch of money to do it, and proceed to haul him out. She finally gets back into the giant sling thing and is put on jacks in the very crowded boatyard. My Better Half is securing things on the inside and the outside with all haste. Haste, in fact, like there’s a hurricane coming. He calls the car rental place and tells them to convert his rental to a one-way. The last we saw of her. Note the beautifully terrifying sky. Previous Post Why is this happening?